Time for some guest photos sent to us from around the world or posted in our Flickr group. 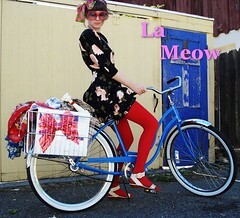 Copenhagen Cycle Chic goes global. Thanks for thinking of us and keep the guest photos coming! KLUNKER" by Gary Fisher. With style, selbstverständlich. Putting the Oh! back into Ottawa. Thanks to Chris. 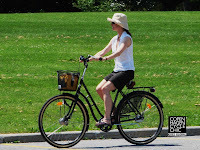 The lady is riding a fine Skeppshult bicycle from Sweden. Montrealcykler in, quelle surprise, Montréal. Proprietor of the Montreal Cykler blog. Michael from NYC and the Drunk and in Charge of a Bicycle blog. It's not Michael in the photo, it's one of his roommates on her new Velorbis Victoria. 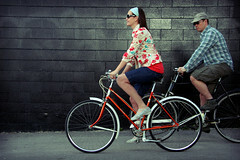 I am SOOO going to post photos of us on our bikes during stampede next month wearing cowboy hats and boots. It's the right thing to do. 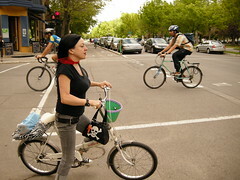 I'm in love with the Velorbis bicycle girl.